What and Where is Hell? We Don't Really Think These Things Through - Do We? One of the most cockamamie ideas I have ever come across. 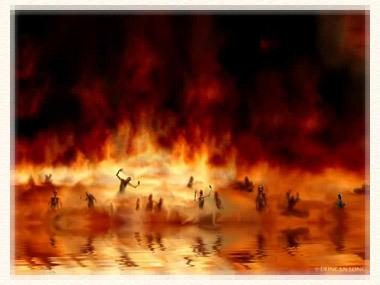 Most Christians accept the traditional doctrine of hell because they believe that it is taught in the Bible. The doctrine of 'hell' as taught by the church isn't some elevated, high-minded, spiritual principle, but boils down to "God loves you, but He is quite prepared to torture you in hell forever". And that this is the "good news", we are supposed to share with others. I am sure that this doctrine makes many believers very uneasy. However, because they believe that hell as a place of unending torment is Scriptural, their only option has been to come up with some justification for this doctrine. Justification for this doctrine is a euphemism for "excuses for the God they claim is loving and merciful"
One completely ridiculous statement that Christians often make goes something like this - "Everyone makes a choice as to where they will spend eternity". Why, oh why do we let these trite phrases roll off our tongues without thinking them through? Most of the decisions we make in our lives boil down to making our own (or someone else's) life more comfortable. We seek the good things, not the bad... pleasure, not pain. So how likely is it that anyone in the history of the earth has ever deliberately chosen an eternity of endless torment and suffering. Some also claim that if a person has made a conscious choice to disregard the Gospel they have, by default chosen to spend trillions of years in torment. Again this is patently ridiculous. Part 2 of Hell by Norman Geisler on the John Ankerberg site begins by saying "a denial of hell is an indication of human depravity" - a proclamation that only serves to show how self-righteous our theologians can get. These sentiments are widely quoted in spite of the fact that they not only defy all logic and common sense, but also do not have a shred of Biblical evidence to support them. Saying that the "heinousness of any crime must be gauged according to the worth or dignity of the person it is committed against" is equivalent to saying that some people have more worth than others. While it is true that most of us will not shed a single tear over the death of a mobster and much of the world mourns a president, is this attributable to our feelings or is the death of one really more heinous than the other? Is the murder of a homeless man less hateful than the murder of the man who lives in a three bedroom house in suburbia? Or perhaps taking the life of a school teacher is worse than taking the life of a janitor. How can stealing from one's own mother be more heinous than stealing from a fellow citizen. Which of the two thefts would we consider more despicable if one's own mother is very well to do and the other person lost their entire month's grocery money? But what saith the Scriptures? Note: 'an eye for an eye' prevented excessive punishment at the hands of an avenging private party. When people use these arguments, I'm sure their intentions are good. But by employing all of this jargon about the infiniteness of our creator, what they are doing is clouding up simple God-given logic. Sin is sin. A crime is a crime. It doesn't matter how nice and loving the victim is. Most people have no trouble understanding this because they already know it in their hearts to be true. And that is one of the most cockamamie theories I have ever come across. Are we really to believe that it is contrary to the nature of God to annihilate the wicked, but it is not contrary to His nature to let people be eternally tormented. And, I just have to ask whether Geisler's Bible contains the account of the great flood, the destruction of Sodom and Gomorrah, the swift annihilation of both Aaron and Eli's sons, etc. Or did he somehow manage not to read those accounts? If the Father snuffed them out once, why exactly wouldn't He do it again. If hell is, as so many Christians believe, a place of eternal torment, then they have to know that Satan did not invent this hell - God did. And, since He could put an end to it in an instant but chooses not to, we can safely conclude that Hell is perfectly in sync with His character. So what does this say about Him? When believers speak of God's goodness, they are usually referring to the fact that, although none of us deserves Heaven, He loves us enough to send His Son to die in our place so that we would not have to. That He has granted us this wonderful opportunity to live in a new world in which there will be no death, no tears, "no longer be any mourning, or crying, or pain " (Revelation 21:4). This concept of hell actually places this 'loving' God far beyond the league of the most notorious human beings that have ever lived. What Hitler did to some six million Jews will seem like a walk in the park compared to the never ending suffering of billions of people - for countless zillions of years. Under what pretext can we still call Him loving or merciful? The only thing that makes this doctrine of unending punishment worse, is that there are those that actually believe that God, from the foundations of the earth, personally chose those who would be saved. The remaining majority were either chosen to be forever punished in hell, or will find themselves there by default. From such a God spare us. And no, this is not blaspheming the God of the Bible, but the monstrous caricature invented by humans. Sadly all the unbiblical ideas about hell as a place of eternal torment have done untold damage to the message of salvation. Who can blame people for being completely incredulous when they hear conflicting messages... God loves them, but has no problem with them being forever tormented in hell. Many of them have (understandably) come to the conclusion that Christians are a gullible and rather stupid bunch, and the God they serve is a horrendous monster, light years away from being "loving". Let us at least try and stick to the message taught by the Scriptures. Those who disbelieve or continue to ignore God's offer of salvation - counter it with what they consider 'clever' arguments and live their short lives on earth as though there was nothing beyond it will all find that is exactly what they will get. God is not going to let anyone into His kingdom who has not chosen to be in His kingdom. At the end of their lives they will be consigned to Sheol/Hades until the first thousand years of Christ's rule are over. It is, by the way, during this period that the weeping and gnashing of teeth takes place. After the millennium, they will be raised to face a formal judgment for their sins which were not atoned for by Christ's death on the cross. This means that since the wages of sin are death (Romans 6:23), they will have to pay this price themselves. This the Bible calls the "second death" which is exactly what it is. Hades itself, having outlived its purpose will be done away with. And no, we cannot complain that God did not warn us that our sin would cost us our lives because He did... over and over again. This includes those people who call themselves Christians, but refuse to become disciples of Christ and follow the path of holiness. They focus instead on what their God can do for them and live their lives exactly as they please, falsely assured that their one time profession of faith will save them. Idolatry is singled out in the Bible as the most abominable of sins. Very strongly worded warnings about idols extend from one end of the Bible to the other, starting with the first two commandments. Therefore, people who worship idols and/or walk down occult paths, have to consider themselves lucky that the popular version of hell does not exist. Because if it did, they would forever be at the mercy of the demons they chose to venerate. One Question: All of which leaves us with one unanswered question - While one can imagine how it is possible that saints will be rewarded "according to their individual deeds." it is not equally clear how one will receive greater condemnation than another at the judgment. For example, Christ speaking to the cities Chorazin and Bethsaida, said .. There are some things we simply do not know. However, the fact that only individuals will be judged not entire cities inclines me to think that these statements were not literally true, but also made to illustrate a point. William G. T. Shedd. W. G. T. Shedd, The Doctrine of Endless Punishment (New York: Charles Scribner's Sons, 1886; reprint, Minneapolis: Klock and Klock, 1980). Norman Geisler. If God, Why Evil? Publisher: Bethany House Publishers (February 1, 2011) Pg. 106..
"Artwork © by Duncan Long. Used with permission. All rights reserved"